A man who was arrested after a bomb hoax which led to Peterborough Passport office being evacuated yesterday, has been released without charge. Police evacuated the passport office on Monday, June 5, after a bomb scare. Police arrested a man in his 50s on suspicion of making a bomb hoax. Officers today confirmed he has been released and no further action will be taken against him. Eyewitness Shaun Nixon said: “I’ve just been outside passport office as police arrived. It follows the unrelated evacuation of Queensgate Shopping Centre yesterday morning after a suspicious package was found. This turned out to be a false alarm. 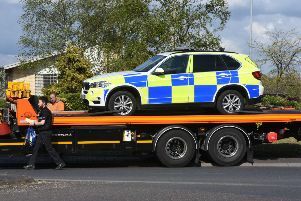 The RAF Wittering bomb squad was en route when the police carried out an inspection ad found there to be no threat. They were stood down.